The brook served as an important route to and from the Dead Sea. 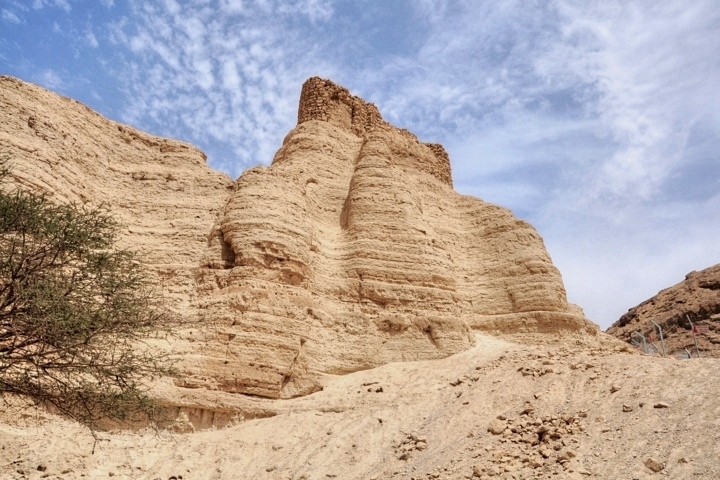 Ancient fortresses were constructed in the valley. 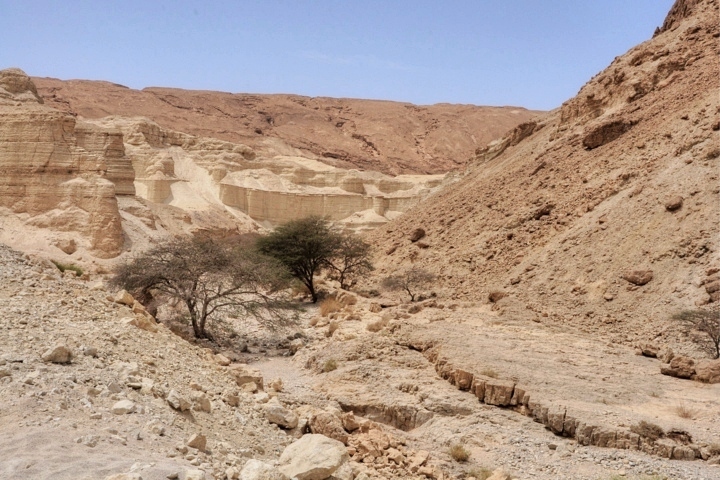 Nahal Zohar is a short brook, 12kM long, flowing into the south-west shore of the Dead Sea. It served in antiquity as an important route, ascending from the Dead Sea to the region of Judea. Fortresses were constructed along the route during the Israelite Kingdom, Hasmonean Kingdom, Roman/Byzantine and Crusaders/Mameluke periods. Nahal (brook) Zohar flows into the delta of the Zohar Oasis, on the south-west shore of the Dead Sea. An aerial photo is shown below, indicating the major points of interest, with the Roman/Byzantine fortress on the left side. You can point on the yellow squares to navigate to the selected place within this or other pages. 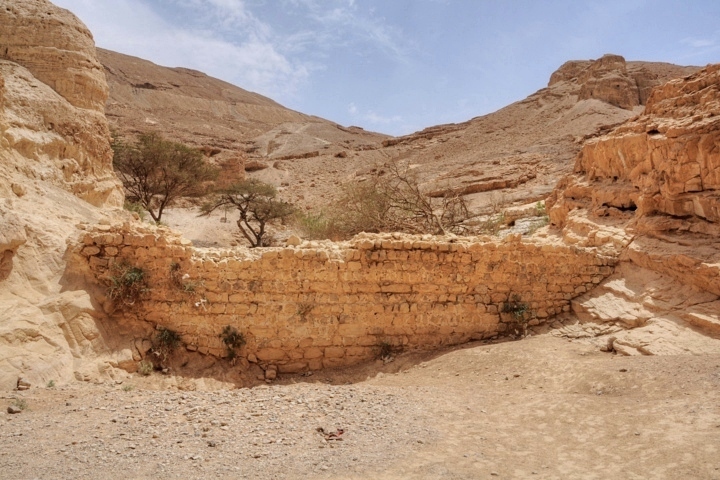 Ruins of a fortress, dated to the Israelite Kingdom period (10th-8th C BC), are located on the northern bank of the valley of the Zohar brook. It was built on the high cliff above the edge of the brook, overlooking the Dead Sea. "And king Jehoram... went and sent to Jehoshaphat the king of Judah, saying, The king of Moab hath rebelled against me: wilt thou go with me against Moab to battle?.. And he said, Which way shall we go up? And he answered, The way through the wilderness of Edom". 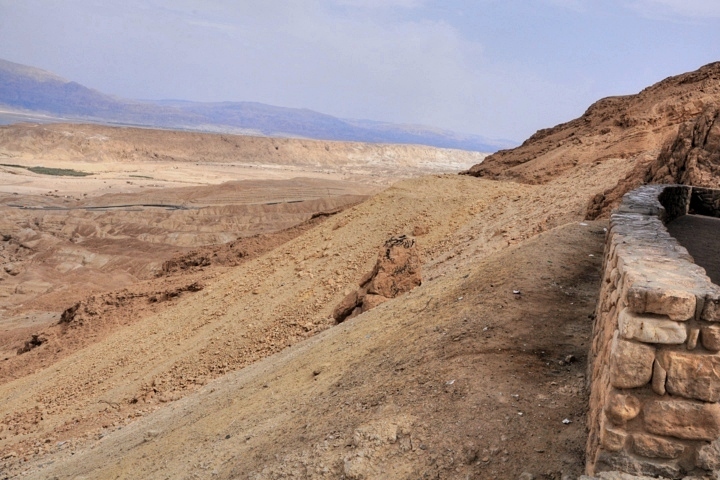 This way took 7 days to reach Moab, and the armies suffered from thirst (2 Kings 3 9): "So the king of Israel went, and the king of Judah, and the king of Edom: and they fetched a compass of seven days' journey: and there was no water for the host, and for the cattle that followed them". "And he said, Thus saith the LORD, Make this valley full of ditches. For thus saith the LORD, Ye shall not see wind, neither shall ye see rain; yet that valley shall be filled with water, that ye may drink, both ye, and your cattle, and your beasts. And this is but a light thing in the sight of the LORD: he will deliver the Moabites also into your hand. And ye shall smite every fenced city, and every choice city, and shall fell every good tree, and stop all wells of water, and mar every good piece of land with stones. And it came to pass in the morning, when the meat offering was offered, that, behold, there came water by the way of Edom, and the country was filled with water". This description of how the water fills up the ditches in the valley, without seeing rain nor wind, fits the nature of the Judean desert. The rain may fall up at higher altitudes, rush down the valleys, and fill up the cisterns. 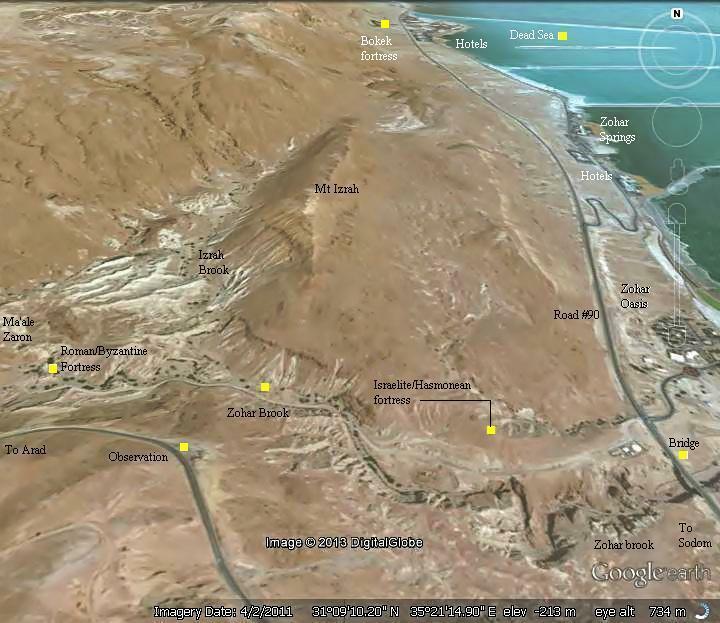 The cities and roads during the early periods are indicated on the Biblical Map below. A suggested route "Edom way" is indicated between Zohar fortress (marked in red) and Arad and Tel Malatha. 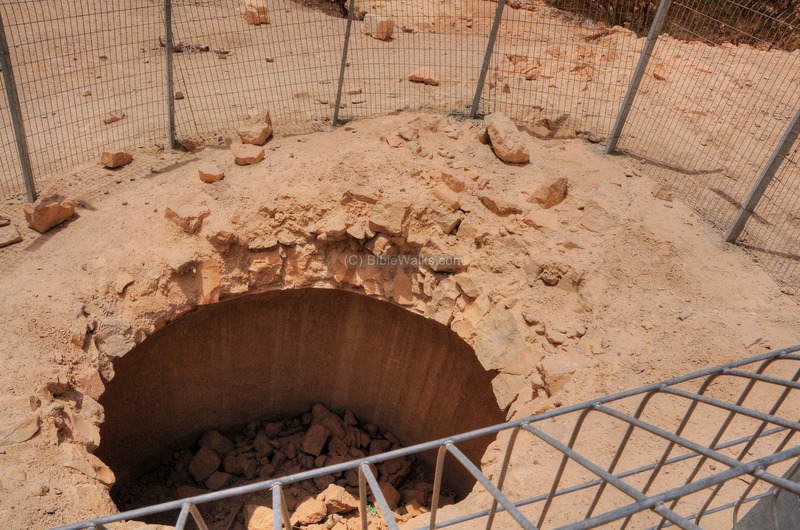 Traces of the Hasmonean fortress were found on a lower level than the Israelite fortress. This fortress was one of the Hasmonean stations along the Dead Sea route, with the next station located in Bokek brook, 6KM to the north. 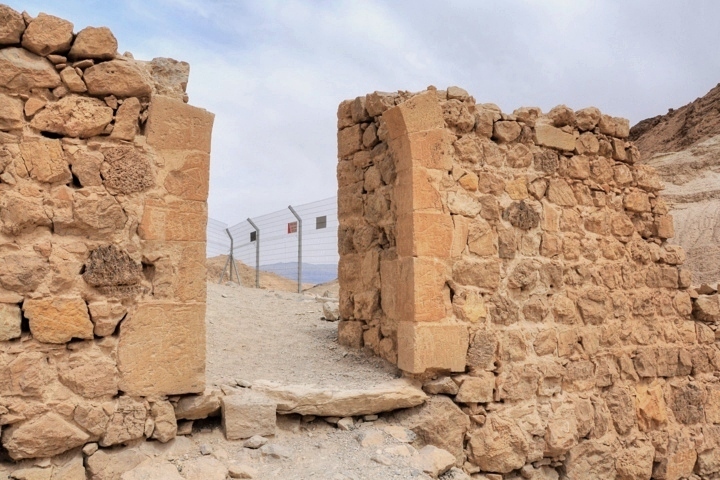 A more impressive remains of a fortress are located inside the Zohar valley, 2.5km from the Dead Sea. The tower of the fortress was built on top of a natural hill, and is preserved in a good condition. 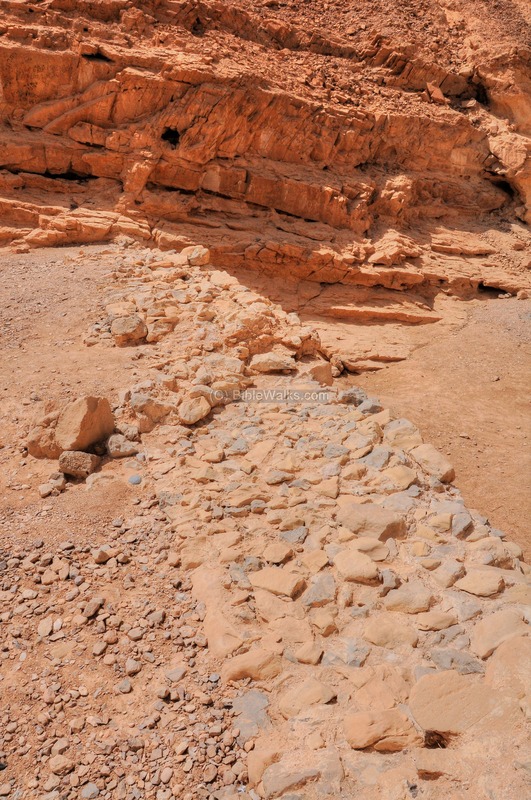 The walls around the fortress have been washed away over the years. Cisterns and dams are located around the fortress, which supplied the water. 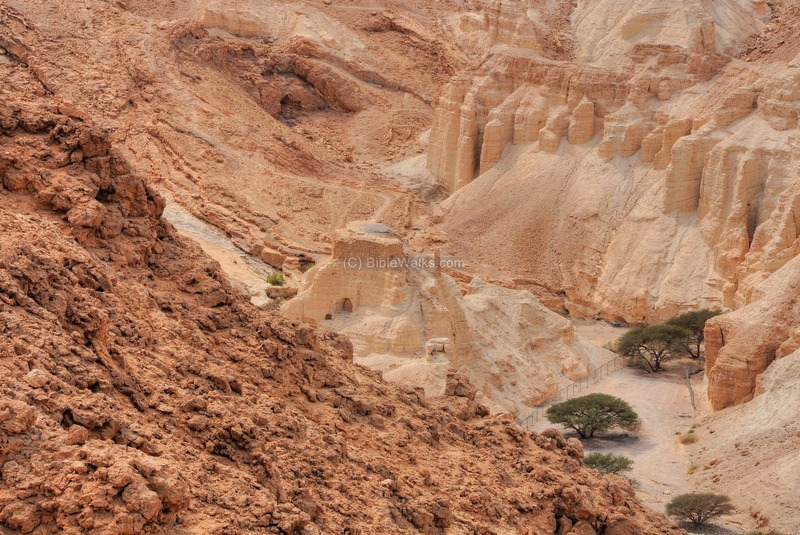 Situated on the ancient route from the Dead Sea to the Judean region, it served both for security and tax collection. 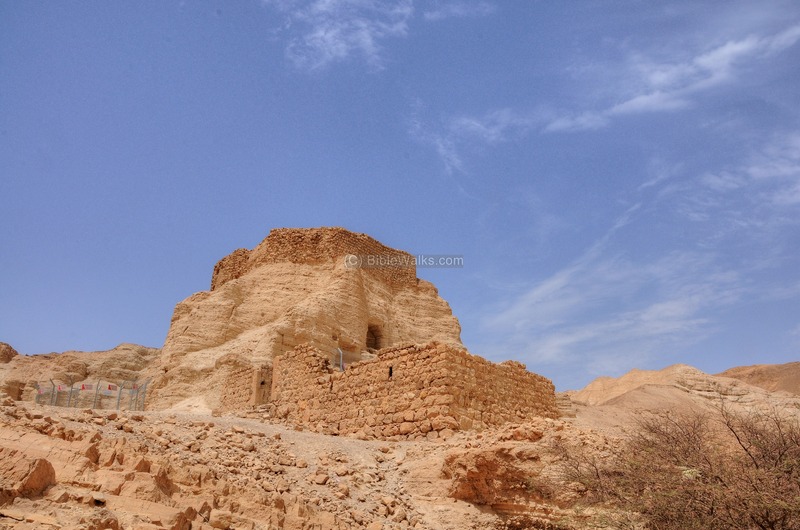 The ruins of the fortress were originally dated to the Roman/Byzantine/Early Arab periods. However, recent survey dated it to later periods: built in the Crusaders period, operated during the Mamluke period (see links). 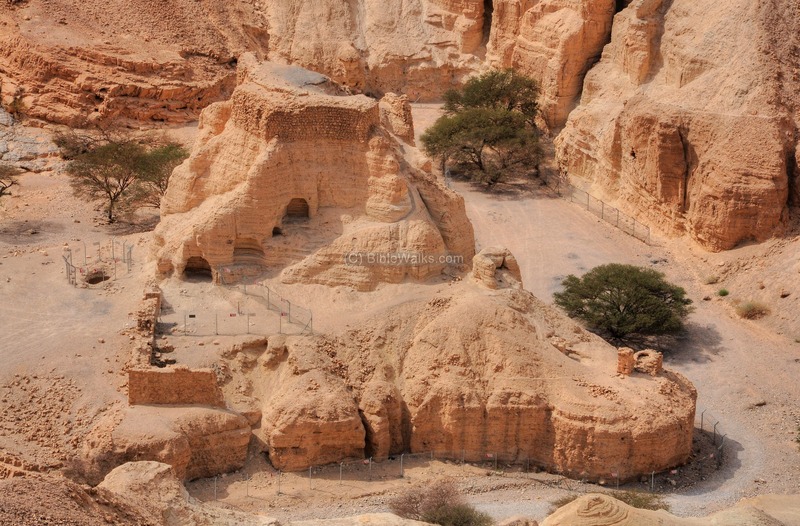 The fortress is an attractive place to visit while you are staying at one of the Dead Sea hotel. The entrance to the valley is only minutes away, accessible by car from the Dead Sea near Neve (Oasis) Zohar. A drone captured the following views of the fortress at Zohar brook. It is built on a marlstone hill, in the center of the stream. This view is from the south side, and the stream flows from left (Judean desert area) to the right (Dead Sea depression). The ancient road passed along the course of the stream, and at this point starts to ascend to the Judean mountains on the left side. The next photo is from the same point, but with a view towards the east. 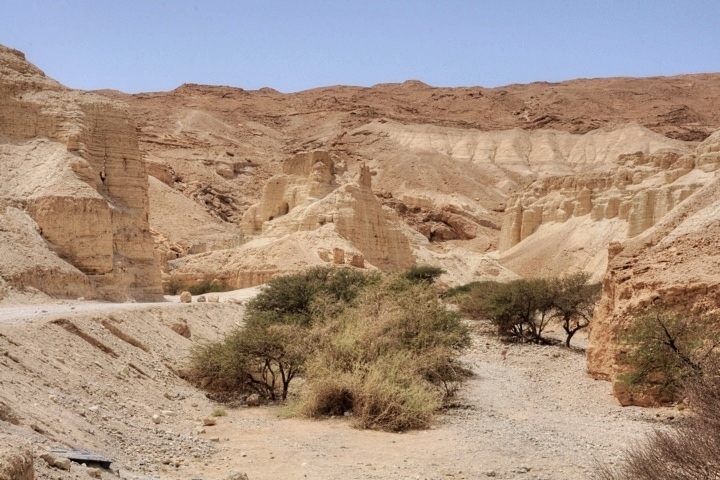 Notice a small section of the Dead Sea in the horizon, with the Jordanian mountains above it. An observation tower is carved inside the nearby hill above the stream. 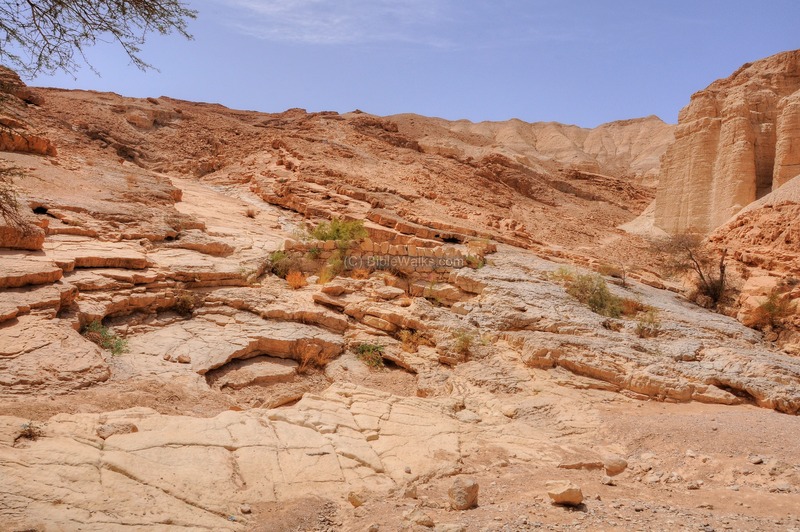 The dry valley of Zohar brook is 200m below the bright mountains on its north and south sides. The brook cuts through the soft layers of the Marlstone, a soft rock (Hebrew: Havar), which is made of calcium carbonate or lime-rich mud. 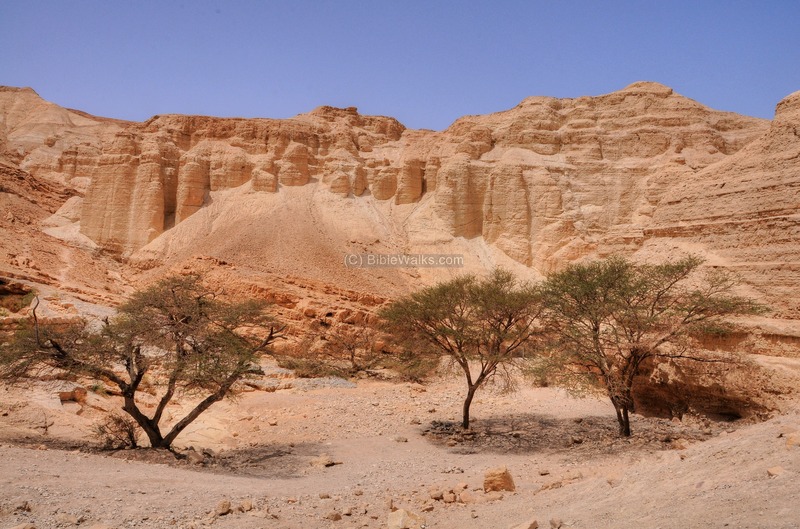 The marlstone is a residue of the deposits accumulated when the Dead Sea covered larger areas, starting from 2 Million years ago. 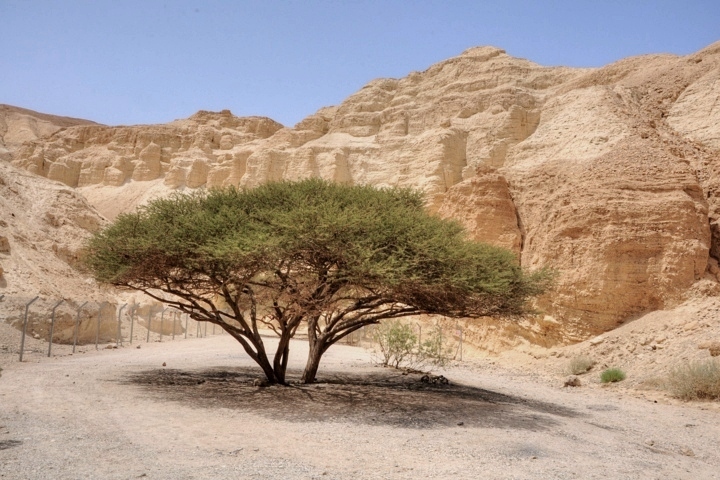 Few trees grow along its course, including the Accacia (Hebrew: Shitah) and Jujube (Sheizaf) trees. After about 1.5km from the entrance to Zohar brook is the Roman/Byzantine fortress, seen here in the center. The ruins of the fortress are built on top of a marlstone hill. The external walls that once surrounded the fortress have collapsed and are gone. 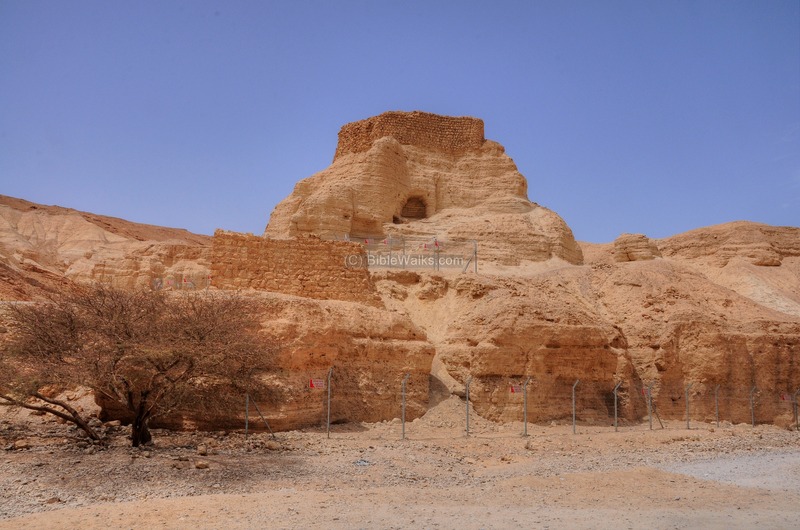 The ruins were originally dated to the Roman/Byzantine period, although recent survey re-dated it to the Crusader/Mameluke period. A view of the fortress from the valley is seen below. 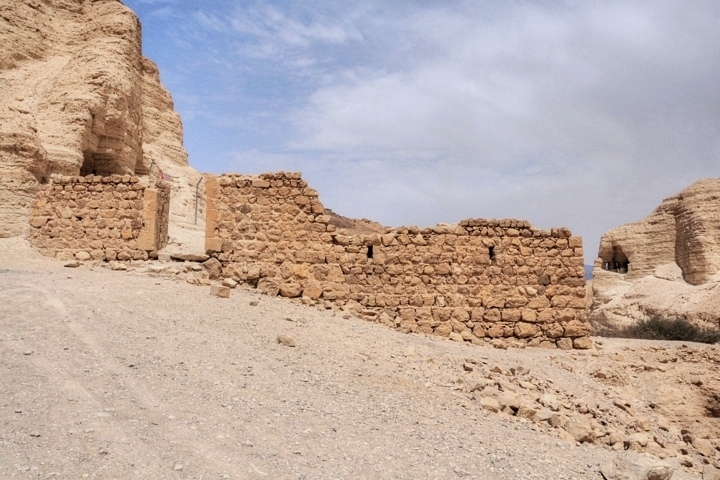 The fortress protected this ancient route during the Roman/Byzantine and Early Arab periods, or perhaps at Crusaders/Mamluke period (as determined in recent survey). During these periods salt was a precious commodity which was carried along the salt roads into the heart of the empire. It is also known that Roman soldiers were paid with sacks of salt. 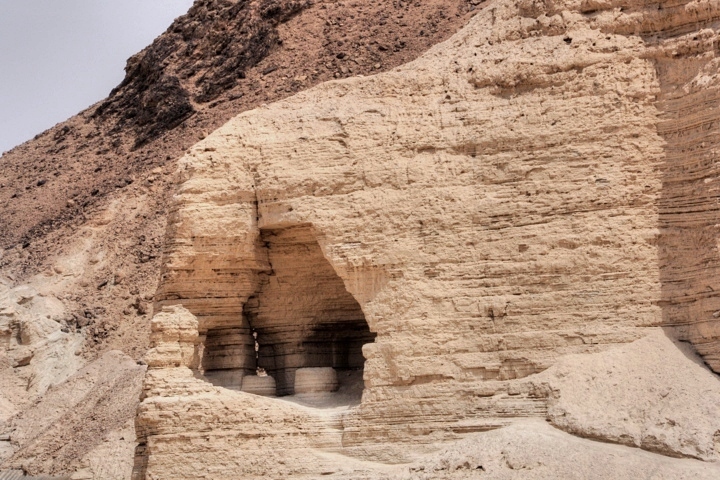 The salt trade caravans that passed this point, ascending from the Dead Sea where it was extracted to Tel Arad and beyond. Therefore, it is likely that the fortress was used to collect taxes from this trade. Entrance to the fortress is located on the south side. A closer view of the entrance is seen next. Although this entrance is open, a fence (behind it) prevents the visitors to climb up the fragile tower. Remains of the arched gate are seen below. A view of the top side of the fortress is seen in the following picture. In front of the fortress, on the south wall of the valley, is a rock hewn observation tower. A trail leads from the valley up to the cliff. 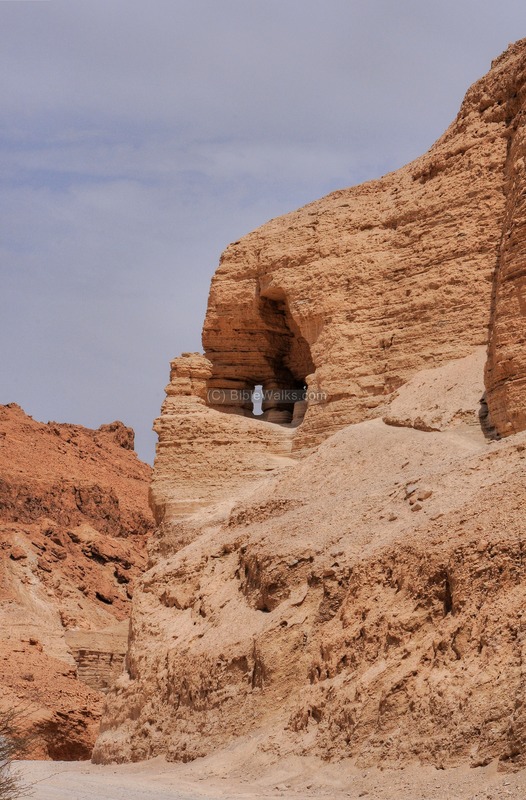 A closer view of this chamber is seen in the following picture. Inside the observation tower are round rocks. 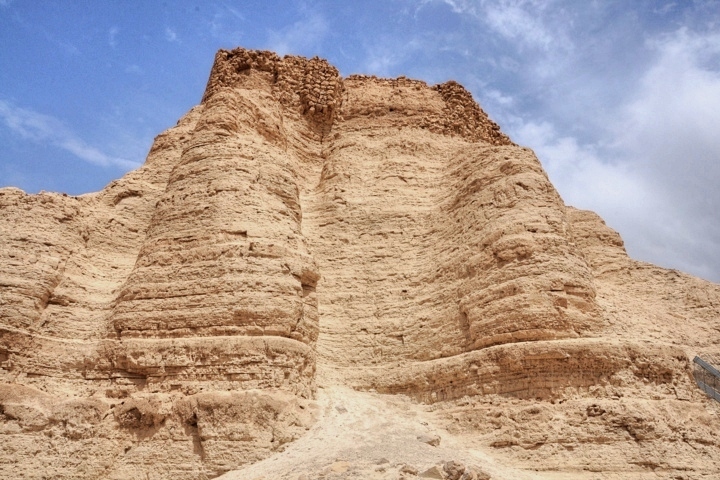 The Judean desert is very dry, and the builders of the fortress had to provide solutions in order to keep the soldiers alive. These measures included building cisterns and dams along the valley. A cistern is located on the foot of the tower. It collected the water from the dams and supplied the water to the fortress. A dam is located on the west side of the fortress. It collected the water in the stream, during the few rainy days, creating a small lake. A closer view of the dam is seen in the next picture. As per the Biblical verses (2 Kings 3 16-20): "And he said, Thus saith the LORD, Make this valley full of ditches. For thus saith the LORD, Ye shall not see wind, neither shall ye see rain; yet that valley shall be filled with water, that ye may drink, both ye, and your cattle, and your beasts. ... And it came to pass in the morning, when the meat offering was offered, that, behold, there came water by the way of Edom, and the country was filled with water". Another dam collected waters from an higher level, as seen in the next photo. The ancient route continued to ascend here towards Tel Arad, using a path called Ma'ale (Hebrew: Ascent) Zaron. The starting point of the Zaron ascent, on the west side of the fortress, is seen in the next photo. 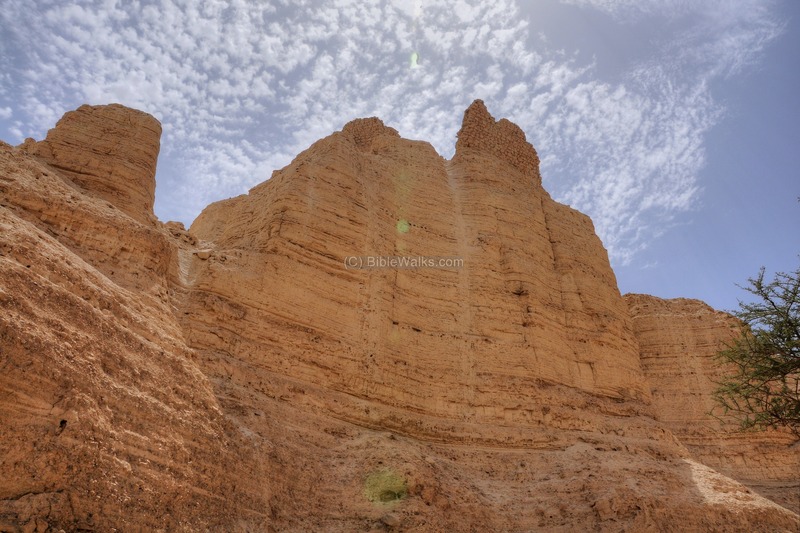 This ascent climbs up sharply from the height of -288m to about 70m above sea level, reaching the foothills of Mt. Zaron (2km away from the fortress). From Mt. 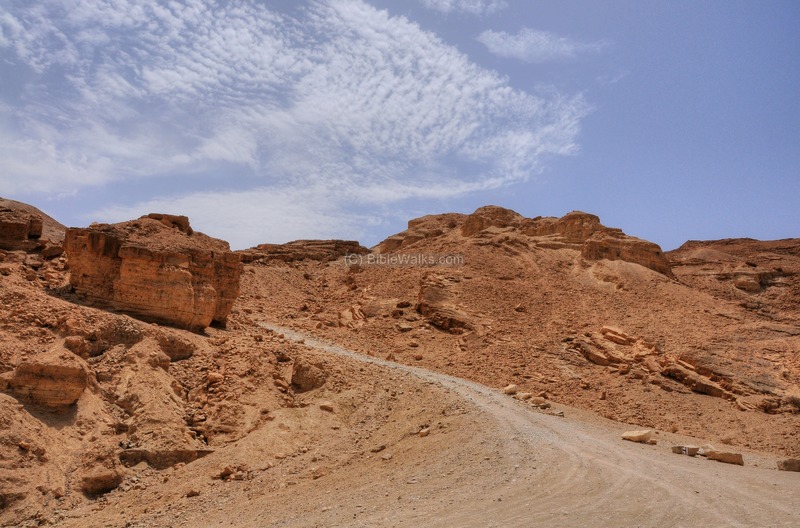 Zaron the ancient road continued thru the Roman fortress of Rosh Zohar (Ras Zueira, height: 552m), which is located 17km away from Zohar fortress. The route then continued to Tel Arad (30km away), and from there to Judea and the land of Israel. An ancient fortress, located on a high point overlooking the brook and the coastal road, is dated to the Israelite Kingdom period (9th/8th C BC). It is seen here as a pile of rocks (called: Rujum) on a low hill, close to the edge of the valley. 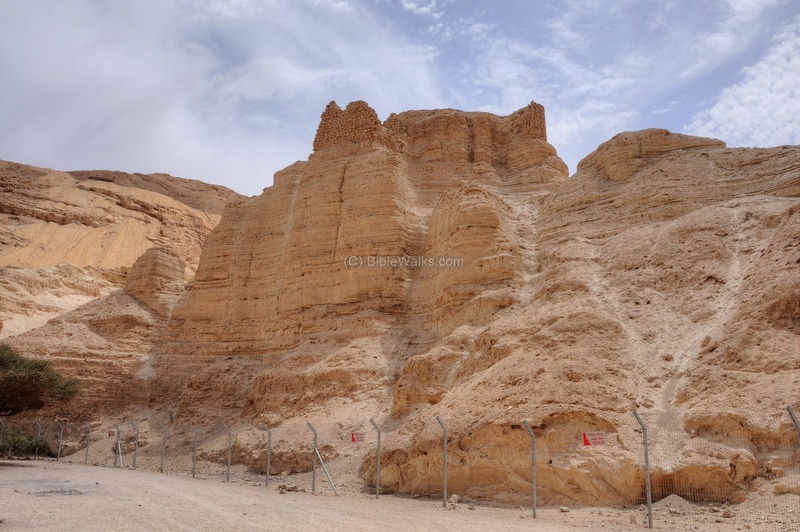 According to the archaeologist Rothenberg, the original size of the fortress was 10m x 10m with a height of 4m. 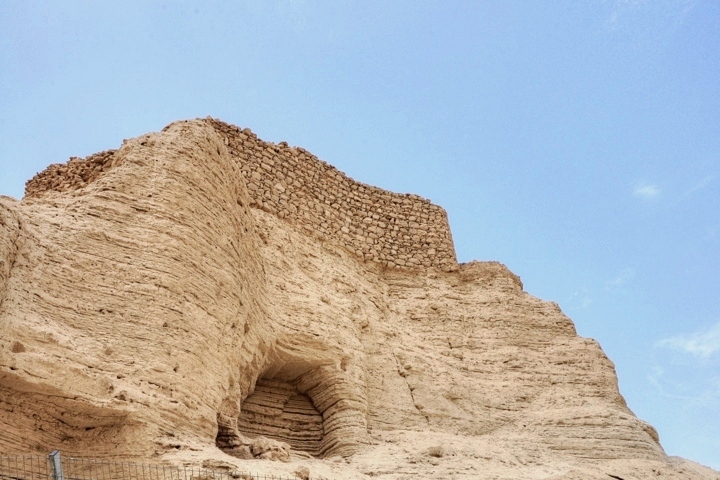 Traces of another fortress is located on a lower level, dated to the Hellenistic/Hasmonean period (2nd/1st C BC). 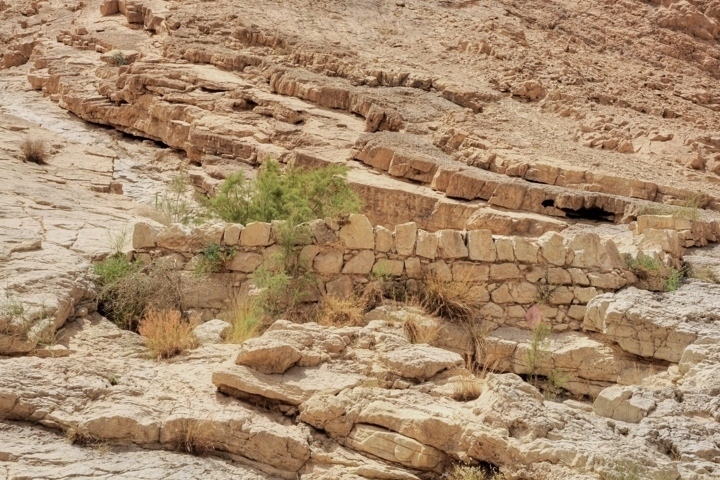 The brook flows into the Dead Sea, joining two other brooks - Nahal Hemar (asphalt) and Nahal Perazim). 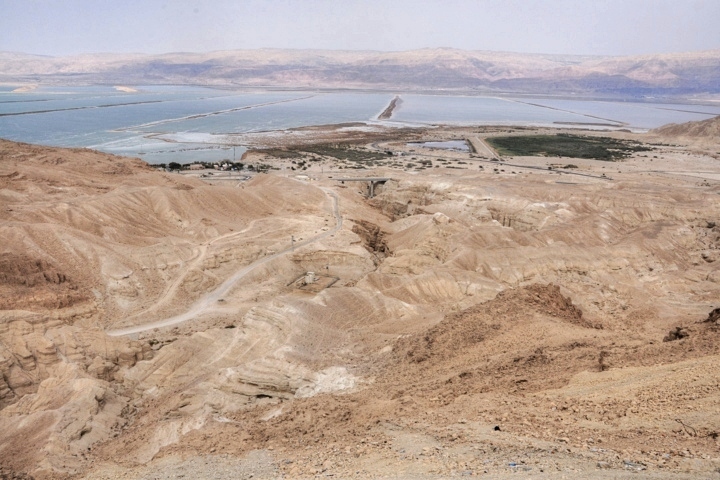 The outlets of these streams created a delta that penetrated into the Dead Sea, as seen below. Three artificial pools, about 10m deep, were created in the delta area. 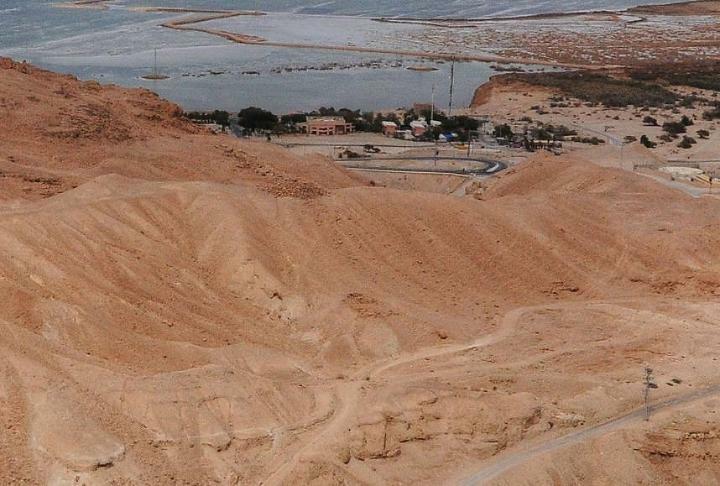 Their soil was extracted in order to construct the dikes of the evaporation pools for the Dead Sea Works potash plant. These pools were also used as fish ponds, growing the Aphanius dispar species which are tolerant to salt water and heat. 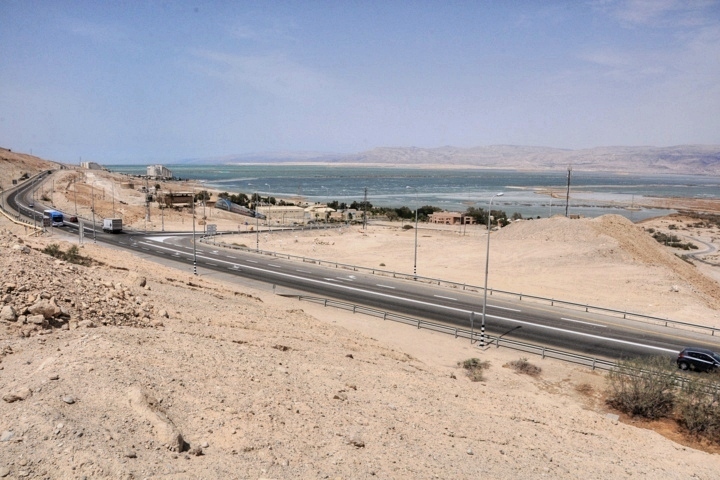 Road #90 passes along the shore of the Dead Sea, connecting Sodom to Ein Gedi. A bridge is built over the Zohar brook outlet. Zohar Oasis (Neve Zohar) is a small communal village, located on the delta of the three brooks. It was founded as a work camp for the Dead Sea Works plant. The village includes 20 residential houses, regional council municipal buildings, and a school. 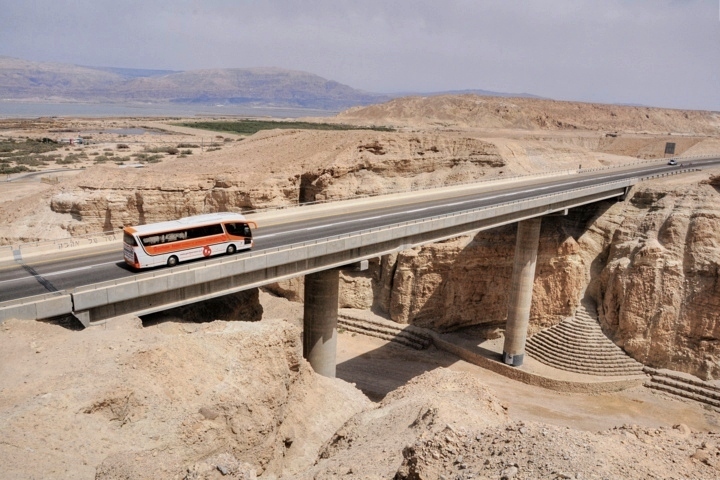 The highway from Zohar to the city of Arad climbs up the mountain along the southern side of Zohar brook. It offers a great view of the area. From the observation point you can see the Roman/Byzantine fortress. On the side of the road is a display of several potatoes-shaped rocks (named "Bulbus"). These were brought from an area west of here. 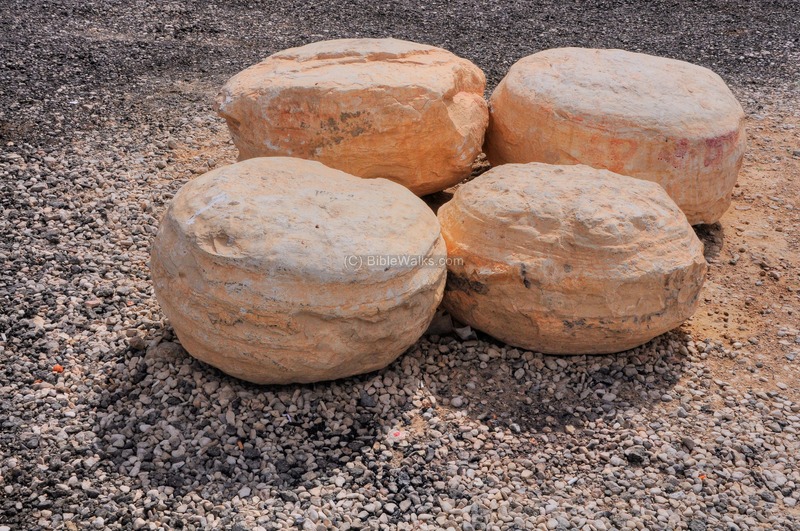 For a review of these stones - see the Mt Zin page. A panoramic view, as seen from the observation point highway above the southern side of the valley, is shown in the following picture. It covers 3km of the length of Zohar brook, from the fortress to Zohar Oasis. If you press on it, a panoramic viewer will pop up. Using this flash-based panoramic viewer, you can move around and zoom in and out, and view the site in full screen mode. Zohar - Hebrew: glow, a modern naming for the valley and mountain; based on the Arabic name. 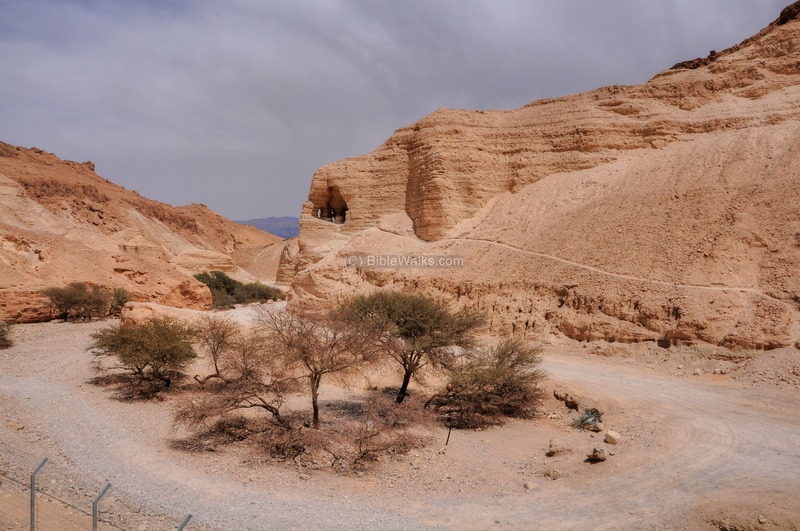 Ras Zueira - Arabic name of the mountain, meaning the mountain of the narrow valley. It was the base of the modern Hebrew name.